The moon is known for its cratered surface. Its lack of atmosphere and proximity to Earth make it easy to observe impact craters from past collisions. Since the Earth and Moon are in the same general region of the solar system, they were likely bombarded at similar rates. While we do find craters on Earth (such as Barringer crater in Arizona), they are typically not as obvious due to wind and water erosion. Most of the craters we see on the Moon occurred during the late heavy bombardment period, nearly 4 billion years ago. According to a model of the early solar system known as the Nice (pronounced neese) model, Jupiter was roughly at its current distance when it entered a 1:2 resonance with Saturn. The resulting resonance drove Neptune (initially closer than Uranus) to the outer edge of the solar system, pushed Uranus and Saturn outward, and scattered much of the remaining protoplanetary material out to the farthest reaches of the solar system. Some of that material was also strewn through the inner solar system, causing the heavy bombardment. There is some evidence to support this idea, as Mercury appears to have gone through a heavy cratering period at the same time. Today our solar system is largely cleared of protoplanetary debris, so sizable crater impacts are not as common. This doesn’t mean they never occur. 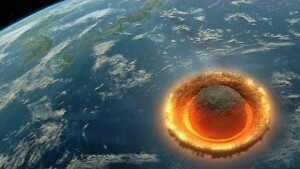 The Chelyabinsk meteor last year comes to mind, though that one didn’t create an impact crater. However an impact on the Moon last year did. You can see the before and after in the image here. It’s not a particularly big change, but it was the largest lunar impact that was observed in real time. The Lunar Reconnaissance Orbiter has found several impact craters not seen in earlier images from the Apollo missions. So we know the Moon is still being bombarded from time to time. It’s all a part of how the lunar surface changes over time. I have been reading ur blogs for over a yr. They have helped me understand my world in more ways than intended. Thank you Dr. Koberlein. One day I hope to be able to join ur patrons but right now I must stretch every $…& then some. I can only offer my prayers to my G-d (it is not the christian though…i hope this doesn’t offend u) for financial prosperity for ur science programs/projects .